1. Please check your TV whether with HDMI port on first before you purchase this item. 3. Select the corresponding HDMI channel. WiFi Display Dongle supports 4 modes- AirMirror/Miracast/Airplay/DLNA. It mirrors the same whole screen (including videos, games, Audio, pictures, Apps and File, etc) from iPhone/Android Smart phone/tablet PC / MAC to a large screen HDTV/ Projector with HDMI interface. Suits for PPT presentation and video meeting. No need driver and app installation. Only 3 steps to enjoy media on a large screen: Plug->Connect->Mirroring via using Miracast, DLAN and Airplay protocol. Connection steps are different depending on the model. Support vehicle HDMI interface. You can connect your phone to car screen in wireless to share Navigation map information. Support synchronization playing of audio and video. The Digital AV HDMI Adaptor can compatible with most of mobile phones / Tablets / NoteBook. 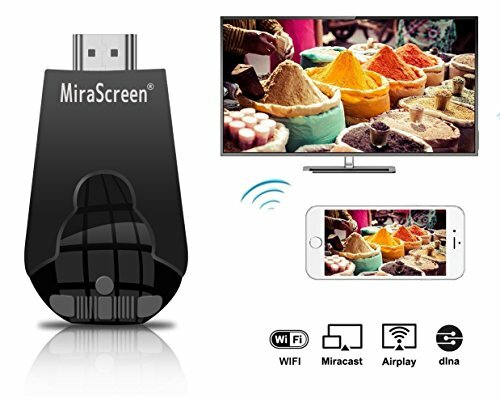 Works for Apple iPhone iPad Devices with iOS 9 or above, Android Devices with 4.4 or above with 1GB RAM, Support most laptop with Miracast enabled Windows, and laptop with Mac OS X system. Supported for most APPs. Not Compatible with Apps which have "HDCP" video copyrights protection like Netflix, Amazon video, SKYGO, HBO go, HULU and Honda motor. Because these App are encrypted and are not authorized for third-party software sharing. If you have any questions about this product by MiraScreen, contact us by completing and submitting the form below. If you are looking for a specif part number, please include it with your message.